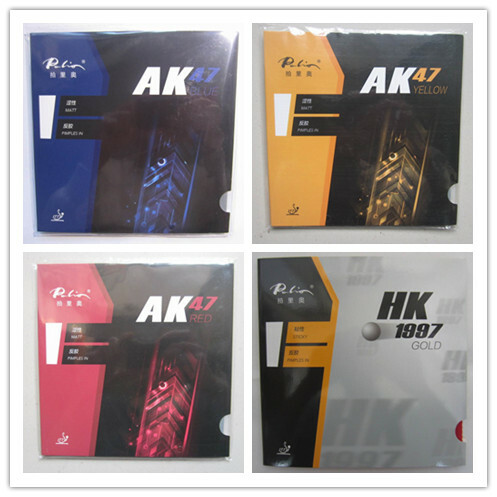 AK47 blue version, with 38 to 40 degrees “killing blue” sponge, foam uniform neat standard breakthrough technology limits, have elasticity and strong support, fully absorb European soft play style, lightness and violence, voice impressively, arbitrary power, accurate to power, to fit a brake can open attack mode, guide the victory. AK47 yellow version, with 42-44 degrees “sharp yellow” sponge, foam uniform neat standard breakthrough technology limits, have elasticity and strong support, the hidden dangers in the equilibrium, pull play all appropriate, not only active power is difficult to prevent, borrows the defense can also be going to, to fit a brake can open attack mode, guide the victory. New HK1997, tie-in 48-50 degrees yellow sponge, fully stimulate sponge activity, no glue and expansive agent, to fit the box, perfect solve hard and don’t play, not play traditional problems. Keep the viscous friction at the same time, speed, strength, flares, and fully support reached a new level, make gold forehand is 40 + era.